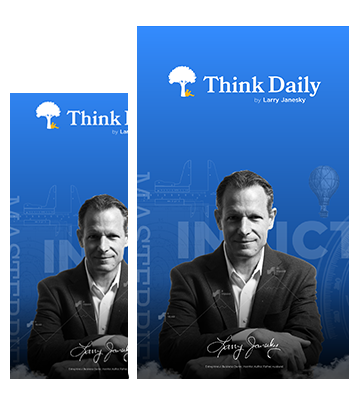 Think Daily for Businesspeople are daily messages from entrepreneur and business owner Larry Janesky. They motivate, educate, and inspire. These business messages can be used to provoke thought or even to kickoff morning meetings. Join the over 25,000 people who receive Larry's daily inspiring messages! Make it easy to buy by removing risk. Make it easy for people to leave, or return goods or cancel. 40 million Americans move each year. The average American moves 11.4 times in their life. What does that mean for your business? If you only focus on revenue, your reputation goes down. Treat people the right way and the money will come. Give value first. Here at Think Daily, have I earned your attention, or stolen it? Make it easy to buy by removing risk. Make it easy for people to leave, or return goods or cancel. 40 million Americans move each year. The average American moves 11.4 times in their life. If you only focus on revenue, your reputation goes down. Treat people the right way and the money will come. Here at Think Daily, have I earned your attention, or stolen it? You have earned it, and continue to do so. You have definitely earned it. Very much appreciated! Thanks Larry. It takes extreme commitment to do these post every day as you have for years. Thanks for the daily dose of inspiration I appreciate you! Earned it. But, I knew the day I met you that you were a class act. You and Kathy invited me to a part/dedication for the new sculptures you acquired and I was blown away you included me. I’ve also been invited to a bbq at your house that I wasnt able to attend. Class act. Money. It’s a terrible master, but an excellent servant. If you are in debt and struggle to pay what you owe, it’s a tyrant. If you have money, you can use it to do wonderful things and put it to work for you solving problems and growing to more money. Money isn’t everything, but when you don’t have any it’s a big issue. To get it, create value for others that they would gladly give you money for – and do it really well.